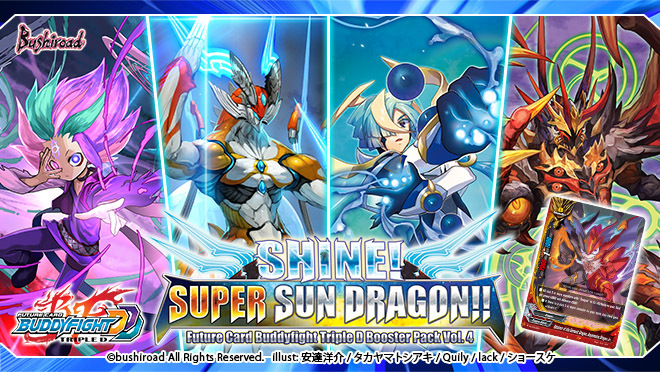 The mystery surrounding “Super Sun Dragon” is finally going to be revealed! Genesis’s revolutionary cards are included in this booster too! Gaito’s Dragon Force awakens and a new impact monster enters the fray! Meet old friends and foes alike with the return of characters from the second season! 118 types of cards RRR: 8 / RR: 12 / R: 30 / U: 30 / C: 30 / BR: 4 / SP: 4 (Parallel) + SECRET: ?? Every pack will definitely have one R or above rarity card! Parallel foils of Commons and Rare Cards are randomly inserted in packs!